It's Wednesday and the middle of the week is for the Liechtenstein Tiara Championship this summer at Luxarazzi. After wins for the Bulgarian Fringe Tiara, the Kinsky Palmette Tiara and the Bavarian Pearl and Diamond Floral Tiara in Group B, it's time for Group A once again. Have fun! 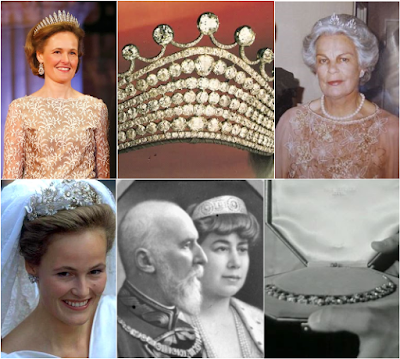 Facing off against each other in Group A are six tiaras from the vaults of the (extended) Princely Family of Liechtenstein, namely (first row from the left) the Habsburg Fringe Tiara, Princess Franziska's Diamond Tiara, the Diamond Honeysuckle Tiara, (second row from the left) the Douglas Floral Tiara, Princess Elsa's Diamond Tiara and Princess Marie's Wedding Gift Tiara. Please cast three votes below, each time for your favourite of the two tiaras. Poland Revisited: Hi There, Paul-Louis!